‘But consider the case of Charles Jaffe: just when was he born? 1879 in Dubrovna, according Jaffe’s Chess Primer, page 5. 1883, according to Chess Review, March 1933, page 2.
about 1876, in Dubrozno, according to his obituary in The New York Times of 12 July 1941, which said he died at age 65.
about 1881, according to The Day and The Jewish Journal (both New York Yiddish newspapers), which said he died at age 60. 10 December 1887, in Dubrovno, according to the Biographical Dictionary of Modern Yiddish Literature, volume 4, columns 203-204. C.N. 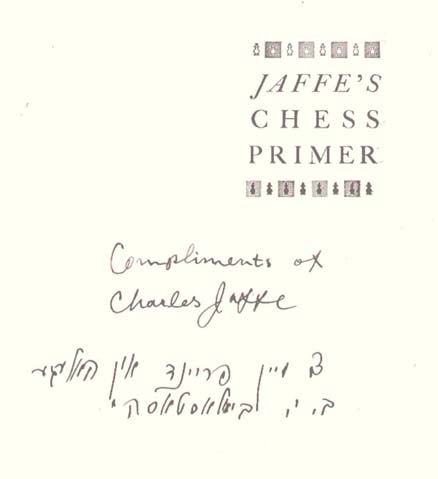 797 quoted a brief passage from Jaffe’s Chess Primer (New York, 1937), but a more detailed scrutiny of that spectacularly awful book is overdue. ‘Charles Jaffe was born in Dubrovna, State of Mogilev on the Dneiper, Russia in 1879. While he attended the Russian and Hebrew schools, he displayed unmistakable signs of native chess talent. At the age of 17 he came to America. He worked as a weaver in the silk mills of New York, New Jersey, and Pennsylvania until he reached the 31st year of his life. In 1910 he became prominent in chess circles both as a player and writer. At the First National American Chess Tournament in 1911 he shared third prize with Oscar Chajes, one-half point behind Capablanca [sic – Marshall won the tournament ahead of the Cuban]. In the same year he won the brilliancy prize [sic - one of 12 brilliancy prizes] and master title [sic – he finished joint bottom (equal 23rd)] at Carlsbaad [sic]. In 1913 at the Second National American Chess Tournament, he won the third prize defeating Capablanca, Janovski [sic], Chajes, Kupchik; but drawing with Marshall who was then US champion. In 1915 he won the New York State Championship [sic - Kupchik won]. He won matches against J. Ohrbach, champion of Paris [sic - presumably Arnold Aurbach - see La Stratégie, October 1911, page 372], Jacques Mieses, champion of Germany [sic], and Oscar Chajes, Western States champion. He has an even record against Jose Capablanca, winning two [sic] and losing two [sic]. In single games he has defeated such eminent players as Dr Emanuel Lasker, Frank J. Marshall, D. Janowski, J. Showalter and a host of others. Charles Jaffe’s career has been both remarkable and tragic. At the very height of his fame his progress was intercepted by Jose Capablanca. At the Havana Tournament of 1913 Mr Capablanca stated to the press that since Jaffe had come to Cuba for the sole purpose of helping Marshall win, he would never again play in a tournament where Jaffe was entered as a contestant. 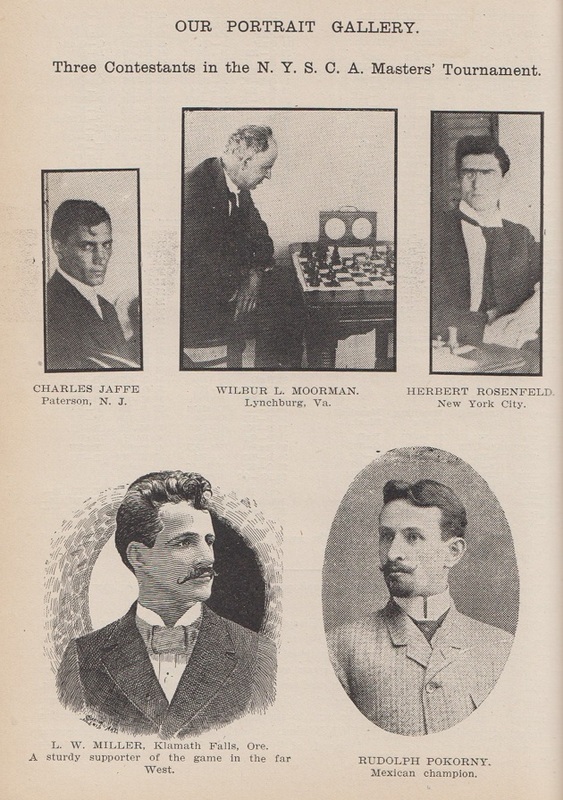 It is certainly deplorable that Messrs Cassel and Helms, the American chess correspondents, not only believed these charges but also aided Capablanca by successfully keeping Jaffe out of all those American Tournaments in which they had influence. It might be noted that the great Dr Emanuel Lasker was driven from the US by very much the same tactics. He was barred from the New York Sextet Master Tournament of 1927. Havana, 1913. 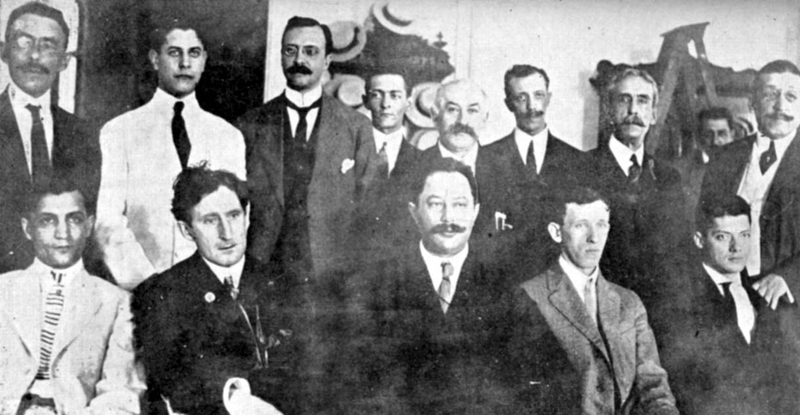 Anti-clockwise from bottom left: C. Jaffe, F.J. Marshall, O. Chajes, A. Kupchik, R. Blanco, L. Paredes, A. Ponce, E. Corzo, H. Cassel, S. Capablanca, J. Corzo, J.R. Capablanca, D. Janowsky. ‘In this book special consideration has been placed on the openings. A player who has not only mastered the openings but understands the direction and inherent value of these forms of play, is able, perforce, to play the middle and end games well. The logic of these openings are [sic] particularly stressed in such manner that the reader will follow the action logically and clearly. Advanced students will undoubtedly note that other moves than the accepted text moves are given. Since Charles Jaffe is considered the first expert on openings, these deviations should be given due consideration. These unorthodox moves have proven unquestionably superior to the others. 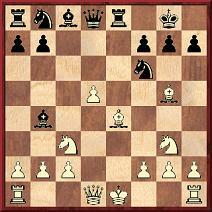 That was followed by, in bold type, the ‘Sicilian Defense (Jaffe Variation)’: 1 e4 c5 2 Nf3 e6 3 d4 cxd4 4 Nxd4 Nf6. ‘This constitutes the Jaffe Variation, but, nevertheless, if White plays properly he has a good game.’ Jaffe neglected to mention that 4…Nf6 had been known for decades, having been played, for instance, several times by Anderssen in his 1861 match against Kolisch. On page 51 the Queen’s Gambit Accepted was discarded in a few lines. 2…dxc4 received a question mark and one cursory, tumbledown sentence: ‘This is striking from the center inasmuch as he cannot hold this gain it is bad on general principles, as we shall see.’ Page 56 referred briefly to the ‘Queen’s Gambit-Declined Indian Defense’, which was Jaffe’s name for 1 d4 Nf6 2 c4 g6. Game 3 was a Jaffe win over Paul Johner (‘Powell Jonner’), while Game 4 was Jaffe v Spielmann (also spelt ‘Spielman’), the introduction to which repeated the misleading remark that it won ‘the’ brilliancy prize at a tournament in Carlsbad (still ‘Carlsbaad’ in Jaffe’s spelling). Game 5 was a Jaffe win against Emanuel Lasker, which, he boasted, marked his debut ‘into the professional chess world’. It was an ‘off-hand game’ (from 1904) according to pages 116-117 of The Collected Games of Emanuel Lasker by K. Whyld, which had Black resigning after 44 Qd3, in contrast to the ‘32 Qd3 Resigns’ in Jaffe’s version. 11...Nxe4 12 Bxd8 Nxc3+ 13 Qe2 Nxe2+ 14 c3 Nxg3+ 15 Kd2 Nxh1 16 Rxh1 Rxd8 17 White resigns. The three consecutive discovered checks are interesting, but the game is fiction. As shown on page 4 of part two of the Carlsbad, 1911 tournament book, the game went 9 exd5 Bxc3+ 10 bxc3 e4 11 Bxe4 Re8 12 Ng3 Nxe4 13 Bxd8 Nxc3+ 14 Kd2 Nxd1+ 15 Ba5 Nb2, and White eventually resigned after Black’s 45th move. 1 d4 f5 2 e4 fxe4 3 c4 e6 4 Nc3 Nf6 5 Bg5 Bb4 6 f3 exf3 7 Nxf3 O-O 8 Bd3 b6 9 O-O Bxc3 10 bxc3 Bb7 11 Ne5 d6 12 Ng4 Nbd7 13 Qe1 Qe8 14 Qh4 Ne4 15 Be7 Rxf1+ 16 Rxf1 d5 17 Rf3 Qg6 18 Rg3 Qe8 19 cxd5 exd5 20 Bxe4 dxe4 21 Nh6+ Kh8 22 Rxg7 Kxg7 23 Nf5+ Kg8 24 Bf6 Kf7 25 Bg5 Kg6 26 g4 Kf7 27 Qxh7+ Ke6 28 Ng7+ Kd6 29 Bf4+ Resigns. Jaffe stated that this was ‘between J. Bernstein and Dr H. Adair played at an International Tournament in N.Y.’, but we have yet to identify the occasion. There was a game between J. Bernstein and Dr G.F. Adair at the New York tournament in July-August 1913 (an event won by Capablanca ahead of Důras), but it ended in a draw. Game 9 was a Marshall brilliancy against ‘Elfen’ Bogoljubow, while Game 10 was an Alekhine loss (the second match game against Euwe in 1935) in which, after 1 d4 Nf6 2 c4, Jaffe gave 2…g6 a question mark. 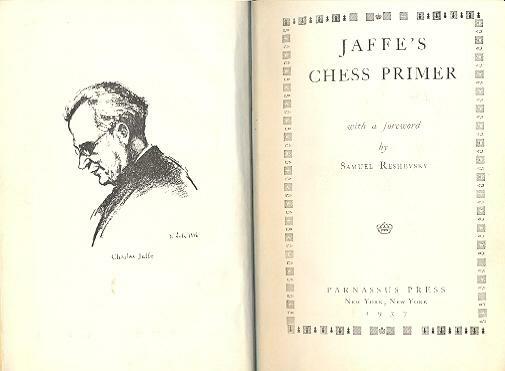 Jaffe’s Chess Primer, all 95 roomy pages of it, is seen mercifully seldom nowadays, and a publisher may be tempted to produce a reprint of what is, after all, a classic pageant of bumptiousness, incompetence and falsehood. 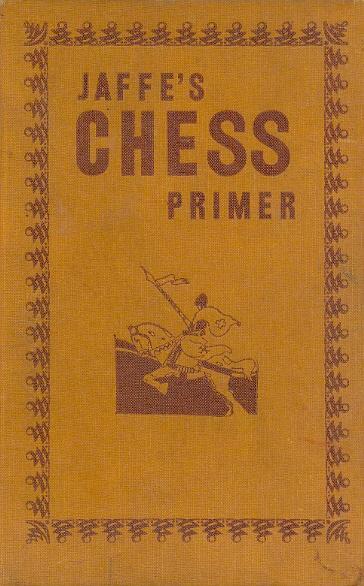 The Primer would certainly fit in well with the chess list of Cardoza Publishing. Note: The above article first appeared as C.N. 2647. A late photograph of Jaffe, seated next to Frank Marshall, was published on page 79 of the May 1940 Chess Review. Page 189 of The World of Chess by A. Saidy and N. Lessing (New York, 1974) has a photograph of Jaffe in play against Lessing. Latest update: 31 July 2018.